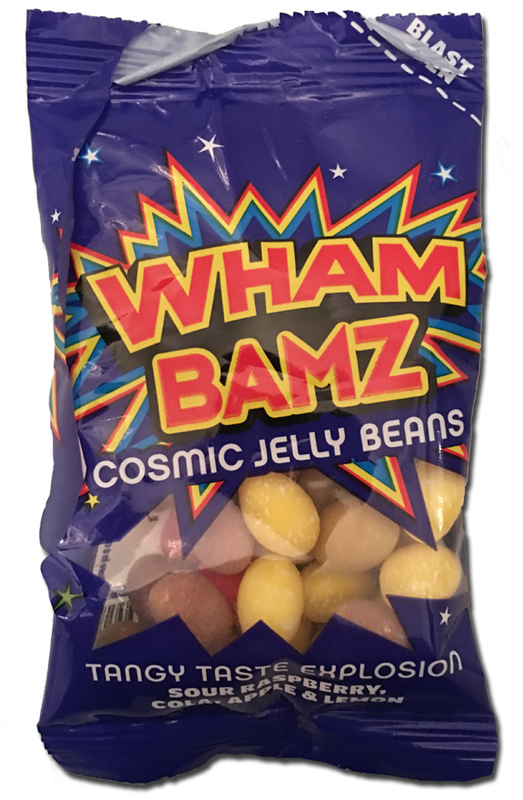 Home » 5 Freshest » Wham Bamz Cosmic Jelly Beans: Yeah. Ok.
An interesting candy these Wham Bamz jelly beans. And by interesting I mean not really interesting at all. Maybe “disappointing” would be a better adjective, but I had no expectations going in. These are sour jelly beans with a semi-solid shell. I thought they’d be like Trolli’s Sour Brite Crawler Eggs but the shell wasn’t as thick and the center wasn’t really a gummy. I’m also used to sour candies being razzle dazzle bright but these have really strangely muted hues. There are 4 flavors: sour raspberry, cola, apple and lemon. A pretty strong assortment, but I can really only discern the cola and lemon. I’m feeling the raspberry a bit but I wanted more fruit flavor. Wham Bamz is a fun name, calling me back to David Bowie’s Suffragette City, but these candies aren’t really a good time. A decent sour but they felt old. 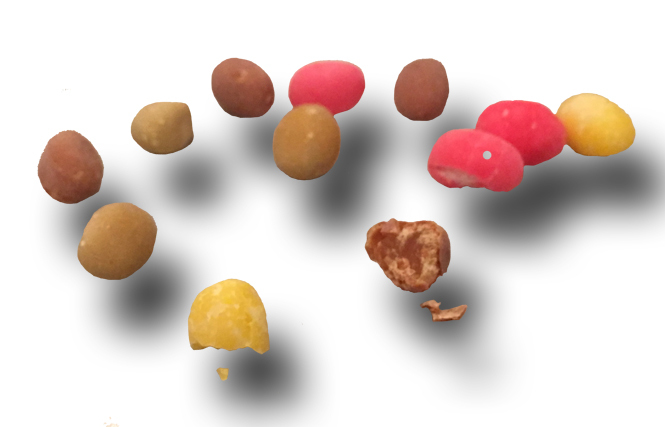 Like aged – and not the gummy “aged”, which makes them chewier and more fun to eat. The Whamz felt tired. The Wham Bamz are made by a company called Tangerine in the UK, who make a lot of good things, like Black Jacks which I love and Jonny hates. And Fruit Salad, which we both agree are great. Tangerine is the parent company of Barratt, which is the brand behind the “Wham” Bar, which appears to be well-known and like Airheads, which I think is what these beans are based on? Now I’mm just making things up. The Wham Bamz bag is small (like the size of a bag of airplane peanuts) so I just ate them all in one go. Even though I kinda didn’t care for them. If you want to buy them, move to the UK, or go here and buy 26 bags. This review is boring. This candy is boring.